It is now official. Senator Hoeven ignored the will of North Dakotans and voted to install Billionaire DeVos as Secretary of Education. Hoeven is now on record as endorsing plagiarism, lying to senators and party over North Dakota citizens. I wrote North Dakota Senator Hoeven two weeks ago to ask him not to support DeVos, who has been a fierce critic of public schools. 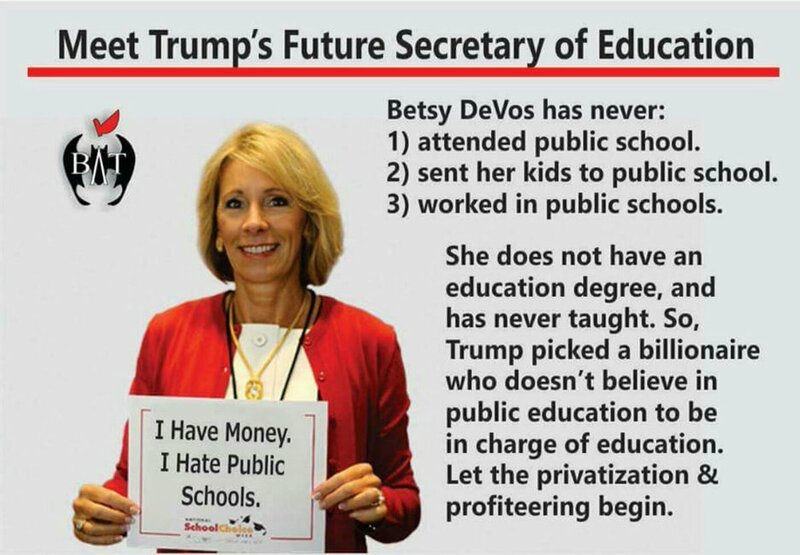 She also wants to use taxpayer money to fund religious schools. "There's just one problem with these numbers, Pallas points out. The Nevada Virtual Academy, for example. Its graduation rate for the class of 2015 wasn't 100 percent. It was 63 percent, according to Nevada's own school report card. Ohio Virtual Academy's 92 percent graduation rate? Try 53 percent. Utah Virtual Academy's 96 percent rate? Cut it in half. Thank you for contacting me regarding President Trump's nomination of Betsy DeVos to be the Secretary of the U.S. Department of Education. I appreciate hearing from you and welcome the opportunity to respond. As a United States Senator, it is my duty to thoroughly review the record and qualifications of each nominee and vote on his or her confirmation accordingly. I take this responsibility seriously and value having your input during the confirmation process. Since the majority of North Dakotans are against her confirmation, I would say you don't give a hoot what your constituents say. You should put your state before party. North Dakota has excellent public schools and teachers who work hard every day to provide our students with a quality education, which is why I have always strongly supported and will continue to support our public education system. When I met with Betsy DeVos, she told me she would not take away funding from public schools in North Dakota. I made a point to ask her if she supports public education and state and local control. She assured me that she does support both, and I have every intention of holding her to that commitment. DeVos has been a vocal critic of public schools, although neither she nor her children have attended one. She has no experience with the system. DeVos is also a plagiarist. Is this a good example for our kids? We worked hard in the Senate during the last Congress to pass the Every Student Succeeds Act with strong bipartisan support. This legislation requires federal funding to go only to states, public school districts, and tribes. It provides both authority and funding for education at the state and local level to ensure that parents, students, and teachers determine how our children are educated. I have worked to make sure that North Dakotans, not the federal government, will make decisions about our children’s education. If North Dakota wishes to make decisions on public schools without interference from the federal policies, they should not receive federal funds. Without federal standards, there is no accountability, such as with the charter schools DeVos pushed for in Michigan, and which have had poor performances. Finally, DeVos has also committed to fully support the Individuals with Disabilities Education Act (IDEA) funding and implementation in written follow-up to her Senate testimony. While it is true she is not a career educator, she does have significant business and administrative skills. I believe that over time North Dakota educators will see that she will be very supportive of them and their outstanding work. How can Ms. DeVos support IDEA funding when she neither understands it, nor will support its implementation in charter schools? What significant skills does she have that apply to educating our youth? It seems most of her experience has been in pushing for, and achieving, substandard charter schools. Again, thank you for contacting me. If I can be of further assistance, please do not hesitate to contact my office at (202) 224-2551. Betsy DeVos and her family have donated tens of million to the Republican party. This is a classic example of pay to play. No one should be able to buy his or her way into a government position. A good article to read on this subject is "Why Betsy Devos Is Riling Education Advocates."